These Chinese zodiac signs snake and rabbit look at things very differently but share excellent love compatibility. The snake and rabbit in love could form a deep intelligent connection initially. The rabbits are shy and reserved, but they can also be sensual. They would rather have a party at home with close friends then go out on the town. They view things more subjectively. On the other hand, the snakes are well liked thanks to their inherent charisma and smart and seductive nature. They are known for their instincts and philosophical way of thinking. The two Chinese zodiac snake and rabbit compatibility can definitely form a satisfying, intimate relationship. In social situations, they are almost completely opposite of one another. The snake rabbit relationship is likely to move from an intelligent connection to a physically and mentally close relationship. In a snake and rabbit marriage, both tend to fit fairly well together. This is especially because of their shared interests. Both enjoy material things, but the rabbit will also be concerned about money continually. Both will have to work past these issues to be happy together. They can be very peaceful together and have great sexual satisfaction in bed. The snake and rabbit soulmates might have issues when it comes to both of them feeling insecure. The rabbit man will require a lot of encouragement from those they are closest to so that they can maintain a feeling of stability. The snake woman might have a problem giving their partner what they need since the they usually have their own insecurities. The snake’s own insecurity can lead them to feel envious towards their partner. Both these Chinese astrology signs will need to work on their individual identities but the good news is this is something they might be able to do together. Both will be able to make each other’s better attributes stand out by encouraging each other. There is a chance the snake man could at times be asking too much of the female rabbit. Both might have issues when it comes to both of them being egotistical and having a lack of confidence. If both were to become more pessimistic, then this could breakup their relationship. They might also argue over money. Snakes are domineering, but the rabbit will be receptive to the way their lover thinks. They will not be that angry if their partner is busy with work related things. At the same time, neither will be particularly compromising with each other. If they are not careful, they might begin to forget about each other if they are both focused on their individual goals. A snake wife and rabbit husband might have arguments because of the snake’s spending. The male rabbit will watch the family’s finances very closely. They might feel their partner is being irresponsible. Both will be able to have a good conversational experience, until their differences work their way in. Chinese astrology compatibility predicts that a snake husband and a rabbit wife will seem to be an ideal couple. They will both be social, charismatic people, but also somewhat temperamental. Sometimes the male snake will lack responsibility and this will force the rabbit woman to take charge. 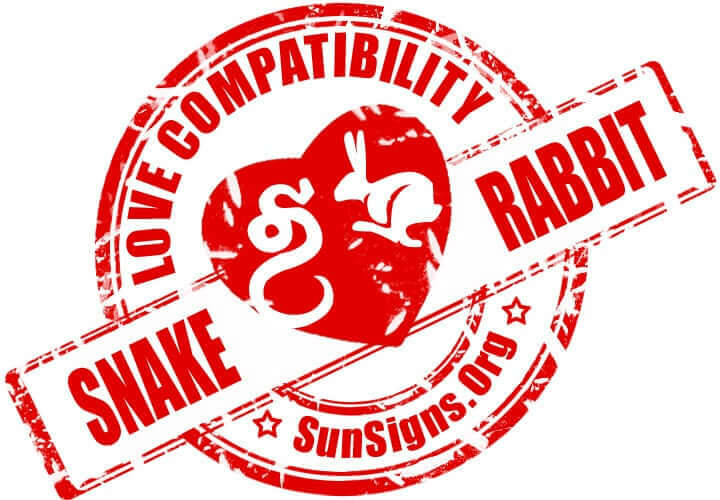 Snake & Rabbit Chinese Horoscope Compatibility Rated 5 Hearts!